The Etruscan civilization is the name given today to the culture and way of life of people of ancient Italy whom ancient Romans called Etrusci or Tusci. The ancient Greeks' word for them was Tyrrhenoi, or Tyrrsenoi. The Etruscans themselves used the term Rasenna, which was syncopated to Rasna or Raśna. As distinguished by its own language, the civilization endured from an unknown prehistoric time prior to the foundation of Rome until its complete assimilation to Italic Rome in the Roman Republic; numerous artifacts of Etruscan culture survived the Roman conquest. For example, according to Jenő Szmodis' research, the ancient roots of Roman Law derive directly from the Etruscan religion. At its maximum extent during the foundation period of Rome and the Roman kingdom, it flourished in three confederacies: of Etruria, of the Po valley and Latium and of Campania. Rome was sited in Etruscan territory. There is considerable evidence that early Rome was dominated by Etruscans until the Romans sacked Veii in 396 BC. Culture that is identifiably and certainly Etruscan developed in Italy after about 800 BC approximately over the range of the preceding Iron Age Villanovan culture. The latter gave way in the seventh century to a culture that was influenced by Greek traders and Greek neighbors in Magna Graecia, the Hellenic civilization of southern Italy. Of the various theories about the ethnic origins of the people who were culturally Villanovan, the noncommittal expression "Proto-Etruscan" is preferred: if the Etruscans were not already the very people living within the range of culturally "Villanovan" sites, they would have had to enter Italy in numbers from the sea, have fought a major war to displace the indigenes, and to have developed into three confederacies of 36 cities, all within 100 years and without leaving any legends or other evidence. An Egyptian inscription at Deir al-Madinah records a victory of Ramesses III over Sea Peoples, including some named Tursha. These are probably the same as the earlier Teresh of the Merneptah Stele, commemorating Merneptah’s victory in a Libyan campaign at about 1220 BC. This may be too early for the Trojan War. Some have connected the name to the city Taruisas, Troy. The Greeks referred to them originally as *Tyrsenoi, later as Tyrrhenoi. Etruscans referred to themselves as "Rasena", possibly a later corruption of "Trasena" ' even "Tlasena" (from Thalassa = pre-Greek or "Pelasgian" for Sea). The first Etruscan settlement in Italy was said to have been Piombina, after an initial settlement in Elba. From there they are said to have spread throughout Etruria. The seafaring Etruscans may simply have sought brides from among their client or host populations, accounting for present-day dispersal patterns of mitochondrial DNA. We have little evidence as to what language the Sea Peoples spoke. They could have assimilated to Etruscan culture, just as the Etruscans assimilated to the Romans. The latter assimilation was thorough. Etruscan tradition accounted that they settled first at Populonia modern Piombino, spreading thence to Volterra. The population of modern Tuscany and Latium is the closest of the moderns to the Etruscans. In an effort to resolve the contradictions, a team of geneticists from different universities in Italy and Spain undertook the first genetic studies of the ancient Etruscans, based on mitochondrial DNA from 80 bone samples taken from tombs dating from the seventh century to the third century BC in Etruria. The results are enlightening but also self-contradictory. This initial genetic study of the Etruscans finds that they were more related to each other than to the population of modern Italy; i.e., they qualify as a partially distinct genetic pool, or "people." Moreover, this pool contained between about 150,000 to 200,000 women. Dividing these numbers by the 36 cities in the three Etruscan leagues obtains an average of between 4167 and 6944 women per community. Selecting an arbitrary family size of four gives a most approximate Etruscan population of 600,000 to 800,000 persons in about 36 communities of an average between 16,668 and 27,776 persons each. These populations are sufficiently dense and sufficiently urban to have accomplished everything the Etruscans were supposed to have accomplished. While this study gives an insight into the genetic composition of the Etruscans, it cannot resolve the linguistic controversy: An invasion of an elite imposing itself over autochthonous subjects often leads to linguistic changes as part of cultural hegemony without leaving genetic traces. 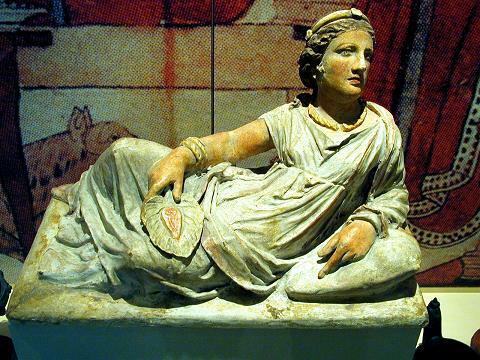 The study has also shown that there is a link between Etruscans and certain populations of Anatolia. In particular, the areas of historical Etruscan occupation have a relatively high concentration of y-haplogroup G.
According to the research conducted by genetic scientists in Italy's Pavia University, the roots of Etruscans were in the ancient Lydian region in Anatolia. The scientists have reached the conclusion by examining 322 Mitochondrial DNA Variations derived from the three districts in Italy's Toscana region where the Etruscans once lived as well as comparing their sequence variation with that of 55 western Eurasian populations. The results also support the information about Etruscans given by famed Greek historian Herodotus, known as the father of history. According to Herodotus the Etruscans immigrated to Italy from the Lydian region, Turkey's modern provinces of İzmir and Manisa. 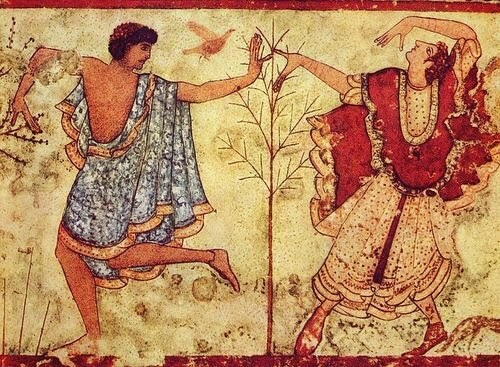 The origin of the Etruscan people has been a focus of major controversy for the past 2,500 years and several hypotheses have been proposed to explain their language and sophisticated culture as well as their origin. The research is thus considered to be an important development supporting the Etruscan people's Aegean/Anatolian origin or the direct genetic input from the Near East, a scenario in agreement with the Lydian origin of Etruscans. The results were published in the “American Journal of Human Genetics." The team found that almost 60% of the mitochondrial DNA in cows in the central Tuscan region of the country - where the Etruscan civilisation is thought to have arisen - was the same as that in cows from Anatolia and the Middle East. There was little or no genetic convergence between cows from the north and south of Italy and those from Turkey and the Middle East, the researchers say. Pellecchia notes that no archaeological or genetic traces of Etruscan culture have been found elsewhere between Turkey and Italy. This, combined with the Etruscans' famed nautical prowess leads Pellecchia to conclude that the Etruscans and their cattle arrived in Italy by sea, and not by land. Mark Thomas, a human geneticist at University College London in the UK, says that European cattle tend to be genetically very similar, so the study's conclusion is plausible.